Today we have a freelance contribution post by Sally. Thank you, Sally, for this helpful post! Homemakers know that being prepared for the winter is the key to a comfortable home when the chill sets in. In Proverbs 30:25, we are reminded that “Ants are creatures of little strength, yet they store up their food for the summer.” Preparing our homes and ourselves for the winter is always viewed as a practical project, but for the Christian homemaker, getting ready for the cold months ahead can also add to the overall charm of the home. 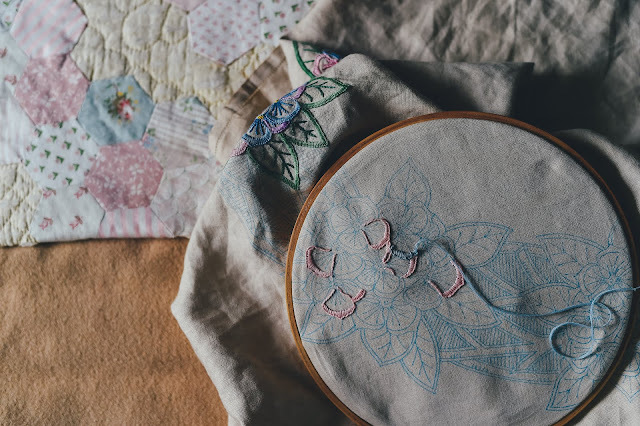 One of the best ways to make sure that everyone stays warm this winter is to take on sewing projects that will keep everyone in your family warm and cozy on snowy days. Here are 3 sewing projects to keep your family warm this winter. The people in Biblical times often wore wool, linen, animal skins, and leather garments. In fact, the prophet Elijah wore a leather belt as part of his humble attire as we are reminded in 2 Kings 1:8, “They replied, ‘He had a garment of hair and had a leather belt around his waist.’ The king said, ‘That was Elijah the Tishbite.’” This project won’t only keep your family warm, but it also recalls this particular time. You’ll need goatskin hides and a basic wool jacket, and since you’re working with leather, you’ll need to use a sewing machine. Simply sever the sleeves of the jacket, then lay the sleeves down on the hides and trace them before cutting the leather sleeves out with a Stanley knife. Pull the leather through the jacket and sew in place. In Biblical times, kings would have summer and winter houses so they could enjoy the warm weather in the former and keep warm in the latter as depicted in Jeremiah 36:22. The verse reads, “Now the king was sitting in the winter house in the ninth month, with a fire burning in the brazier before him.” While most of us only have one house to shelter our family from the elements, we can certainly find a way to make it more pleasant when the bitter cold arrives. To keep your home warm, sew a DIY draft blocker. Sew a piece of fabric to create a long tube, taking care to leave one end open. Fill it with wadding, cotton, or bits of fabric scraps before sewing it shut. Place draft blockers under your doors and windows to prevent the cold air from entering your home. We use our hands to work, comfort our children, and we lift them up in praise of our Lord. Keep your hands warm this winter with DIY hand warmers. Sew two pieces of fabric together, leaving one end open. Fill with uncooked rice and sew it closed. To use, heat in the microwave for about 5 minutes before handing them over to your family members. Try any of these simple sewing projects to keep your family warm and cozy this winter.